available in two sizes: Reg. 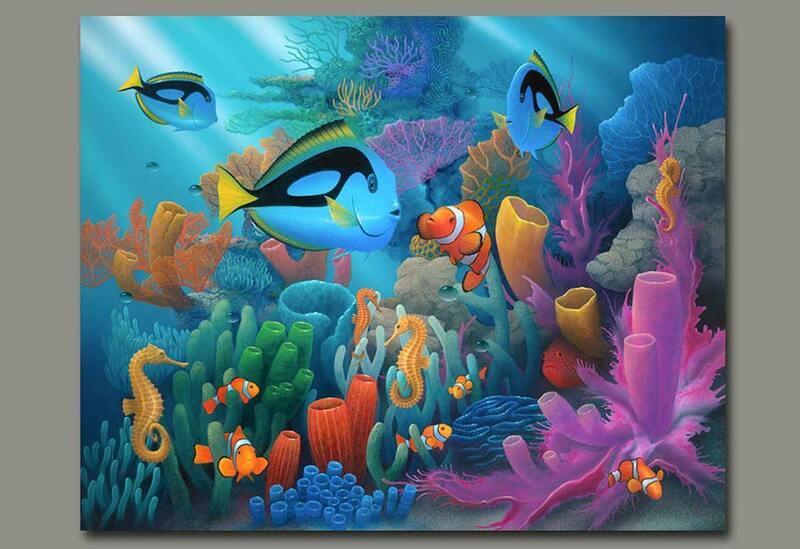 31" x 41" x 1.5 " or Large 35" x 46" x 1.5"
Artist David Miller has a diverse collection of underwater paintings and coral reef paintings that highlight the beauty and mystery of the sea. His highly colorful style is ideal for bringing to life the amazing fish, dolphins and coral that are unique to coral reef and underwater environments. These underwater paintings capture the true essence of the rich diversity of life forms located in coral reefs and captured in paintings. A David Miller underwater or coral reef painting can bring a unique perspective from a unseen world into your home.